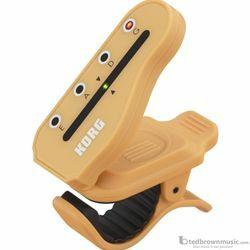 The tuner that's shaped like a headstock- The ideal clip-on guitar/bass/ukulele tuner for beginners. The Headtune is a clip-on tuner with a unique design that's based on the shape of a guitar, bass, or ukulele headstock. With the Headtune attached to the headstock of your instrument, play a single note on the string that you want to tune. Two indicators will illuminate: the string indicator LED will show the peg position, and the LED meter will indicate the tuning of that note. This makes it obvious which peg needs to be adjusted. You can choose from a lineup consisting of four models: two models that are suitable for standard guitar headstocks, a model for bass, and a model for ukulele. With the innovation and precision you expect from Korg, the Headtune makes tuning easy!